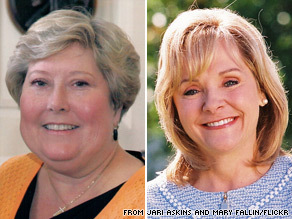 Democrat Jari Askins (left) and Republican Mary Fallin (right) each secured their party’s nomination and will face off in Oklahoma’s gubernatorial election. (CNN) - Oklahomans will elect their first female governor come November, after two women secured their party's nomination in last night's gubernatorial primaries. Lt. Gov. Jari Askins defeated her Democratic challenger, Oklahoma Attorney General Drew Edmondson, by less than six-tenths of one percent of the vote, according to Oklahoma's State Election Board . Despite the razor-thin margin, Edmondson conceded the race and threw his support behind Askins. As expected, Rep. Mary Fallin secured the Republican nomination, trouncing her three challengers and handily avoiding a runoff election. Fallin and Askins will now face off to succeed Democratic Gob. Brad Henry, who is prevented by term limits from running for a third term. Both the Rothenberg Political Report and the Cook Political Report, two of the top non-partisan political handicappers, say the Republicans are favored to pick up the governor's seat in a state that Sen. John McCain won by 32 points over Sen. Barack Obama in the 2008 presidential election. Sorry Askins, as you know the people of Oklahmoma are the best people in America, proven by the fact that all counties go red. There is just too much good in the hearts of the people there, people who do the right thing, feel remorse, want to help their neighbors and never wish death of their fellow Americans for disagreeing with them. There is no way that as a Democrat, representing the values of Blago, Obama, Rangel, and Jefferson, that she can win. What's wrong with a woman leading? Nothing. The person who generally sounds like she cares about the people should win; the winner should not be worried more about their political career. Good luck to both; remember to keep the contest clean! Some how it just dosnt seem normal to have women as leaders it just dosnt give the Adam and Eve theory justice . Just a matter of time, until everything falls under the control of women.....and the male politicians are doing everything they can to assure that will happen. You know, we shouldn't judge folks by their looks, but if the captions weren't on these pics, it would still be easy to see who is the Democrat and who isn't. the repub candidate has the typical vapid expression of a Fux Noise zombie. At least the campaign will be more about issues and less about it being a historical first for a demographic. Novelty voting didn't workout so well in 2008.